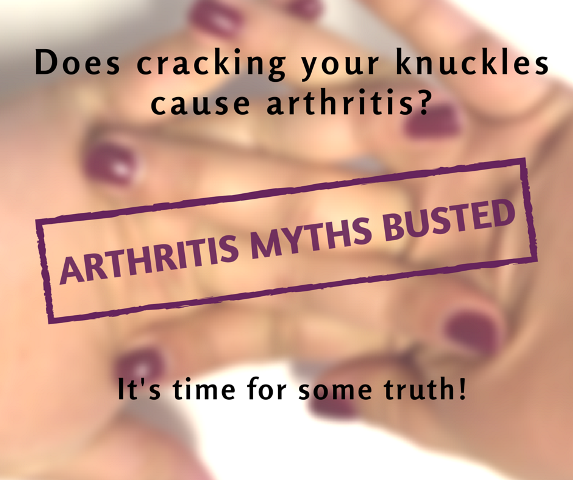 Cracking your knuckles can cause arthritis? Myth or reality? (Myth). Arthritis is the inflammation of joints and surrounding tissues, and is a very painful condition for most sufferers. It occurs for any number of reasons, such as old age, autoimmune issues, and inflammatory diseases (but not from cracking knuckles!). Only old people get arthritis: Arthritis does frequently affect the elderly, but people of all ages suffer from it, even children. Juvenile arthritis is also a serious condition diagnosed in kids aged sixteen and younger. Damp conditions trigger pain: Arthritis is found in people all over the map, with zero regard to climate. Although anecdotal stories abound of arthritis sufferers predicting the weather, there is no scientific link between wet weather, or any weather, and arthritic pain. Heat is better for pain than cold treatment: It is mostly a matter of preference. Both heat and cold can help treat pain. Cold, or ice, eases joint inflammation, while heat can relax muscles and tendons surrounding the achy joint. Glucosamine is right for everyone: Opinions are mixed on this natural supplement and arthritis pain. While some followers of alternative medicine support taking it, others in traditional medical fields claim it has no real effect unless injected directly into the joint. Results vary according to individual, so check with your doctor before taking it. Diet has little effect on arthritis pain: While there are no magic foods that cure arthritis, there are things to incorporate in your diet to help alleviate pain and fight inflammation. Foods with anti-inflammatory properties include fish, olive oil, whole grains, fruits and vegetables. If your pain is still unmanageable after trying physical therapy, exercise, and routine medications, contact our office to discuss your options. Are you Hip to Your Hip Replacement?